I purchased this mask as part of my Pretty and Cute haul from back in September! This mask fit my face a bit better than the other masks I have tried. It still is too small at the nose, and a bit too much extra at the jawline, but the eye holes were big enough. Also, the mask doesn't lay down completely on the sides of my nose. It has been an issue with the other masks as well, but I forgot to mention it. 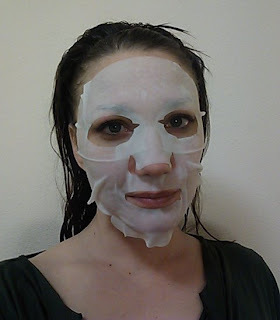 It doesn't bother me because I use masks as more of a novelty rather than a real part of my grooming routine, but if I were using the mask frequently, it would bother me. Here's a silly picture! Right out of the pouch, it is very wet, which I think it should be. It does have a somewhat strong fragrance, floral and clean, but the scent seemed to fade quickly. I thought it was pleasant, but it is more scent than I like for a product that is going to sit right beneath my nose for 20 minutes. I'm in the middle for scent sensitivity, I think. It did give me a slight headache, but not bad enough to take a pain reliever for it. The instructions are translated perfectly. The only thing that confused me is it said to "unfold and remove film" after taking it out of the pouch, but I didn't see a film on it. I applied it, and it felt wet and cold, as expected. I wore it for 20 minutes, removed it, rubbed the remaining liquid into my skin, and let it dry. My face felt very soft and smooth, and it also looked quite pale. The paleness that I experience after removing these types of masks seems to be from the cold temperature of the masks. The packet says use it every 2-3 days for maximum efficacy. I tend to use masks very sporadically, so I highly doubt this will become part of my routine often enough to actually see any cumulative results. I like how soft and smooth it made my skin feel. That result lasted into the next day and evening (tonight). Because the results were tactile, and not visible, I didn't bother with before and after pictures for this mask. Thanks for stopping by! It's pretty silly looking.. haha!